At its annual [email protected] event, Acer formally introduced the Predator X27, its new flagship gaming display. The company's first HDR monitor, the Predator X27 is Acer's implementation of NVIDIA's prototype HDR monitor design, which we first saw back at CES 2017. So like NVIDIA's prototype, Acer is aiming for the top with this monitor, offering 4K, HDR, a wide color gamut, and a high refresh rate all in a single display. Unfortunately for those of you eager to shell out for the Rolls-Royce of gaming monitors, you'll have to wait a bit longer; Acer is not announcing a release date or a price at this time. 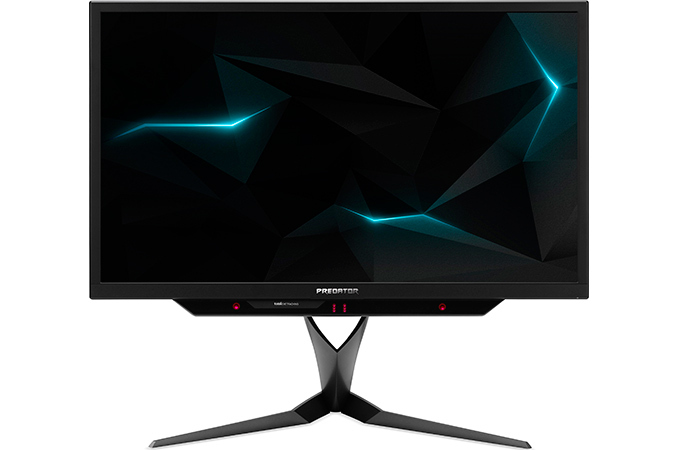 By the numbers, the Predator X27 offers a 4K resolution, a 144 Hz refresh rate, a 1000-nits brightness, and uses a quantum dot film to enable HDR10 and the DCI-P3 color gamut. To further appeal to gamers, the Predator X27 also supports NVIDIA’s G-Sync HDR technology as well as Tobii eye-tracking. The new unit is one of a few announced 4K displays to support such a high refresh rate along with HDR10 and NVIDIA’s G-Sync HDR technology. 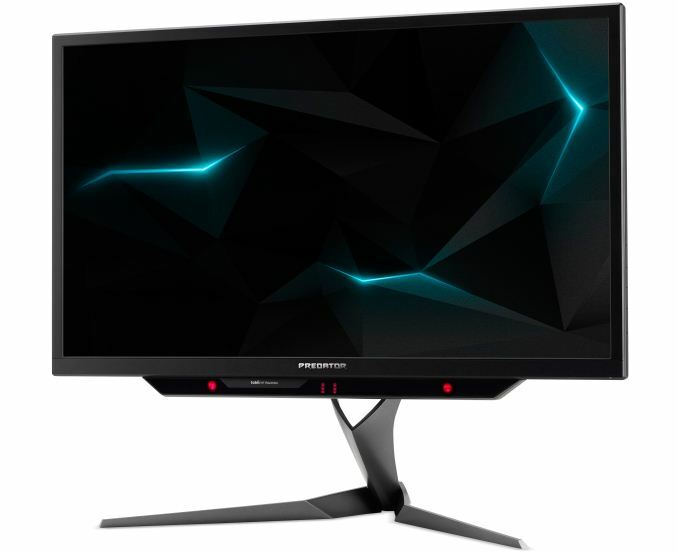 The Acer Predator X27 is based on AU Optronics’ M270QAN02.2 AHVA panel with a 3840×2160 resolution, 178°/178° horizontal/vertical viewing angles, up to 1,000 nits brightness, a 4 ms response time and a 144 Hz refresh rate. The monitor comes with a direct LED backlighting system with 384 zones, which ensures both high brightness as well as better contrast ratios through localized dimming. The backlighting system is further enhanced with a quantum dot film in order to give the monitor wide color gamut capabilities, allowing it to display 96% of the DCI-P3 color gamut, which pairs up nicely with its HDR support via the HDR10 format. Finally, the Predator X27 features NVIDIA's G-Sync HDR variable refresh rate technology. To take full advantage of the Predator X27 monitor, gamers are going to need an NVIDIA GeForce GTX 10-series graphics card with a DisplayPort 1.4 connector. NVIDIA & Acer are using every bit of bandwidth offered by DisplayPort 1.4 here, and even that's not enough; the X27's bandwidth requirements actually exceed what DisplayPort can provide. As a result the monitor (like all monitors based on the NVIDIA design) will use 4:2:2 chroma subsampling when gaming to stay within the bandwidth confines of DisplayPort 1.4. Meanwhile as you might expect, the display's lone HDMI 2.0 port is limited to 60Hz operation. In addition, expect the display to require a USB cable to control the Tobii eye-tracking hardware. To date, only Acer and ASUS have announced gaming displays powered by the M270QAN02.2 AHVA panel from AUO and supporting 4Kp144 with a 1,000 nits brightness, quantum dots, and HDR10. Such monitors in many ways represent a new generation of gaming displays that support not only a high resolution and refresh rate, but also the DCI-P3 color saturation, advanced backlighting with local dimming, and so on. Acer remained tight-lipped about pricing and availability timeframe of its Predator X27 display, but since AU Optronics is reportedly kicking off mass production of its M270QAN02.2 in July, it is likely that Acer, ASUS and other companies that use the panel may start selling their products on its base in late Q3, or early Q4 2017. As for pricing, we may well be talking about devices with MSRPs north from $1500 (some whispers say so), but Acer and its rivals yet have to announce their MSRPs.